Why Not Volunteer as a nurse? Has it been difficult for you to find your first nursing job after finishing nursing school? Recruiters often say, “You need to get a year’s experience.” How are you supposed to get the year’s experience if no one is willing to take a chance on you? Courtney Lenberg, RN, from www.fromnewtoicu.com, guest posts about her volunteer nursing experience prior to getting a paying job. The most impressive thing that I did to beef up my resume was volunteer! I had always wanted to go abroad and help those less fortunate. Luckily for me I was able to get nursing experience that helped me professionally as well! I tried to use my license in any way possible, even if I wasn’t getting paid for it. During my future job interviews, this showed that I was motivated to get my first nursing job even though it was difficult. I volunteered for five months as a nurse through LDS Charities on the USNS Comfort, a Navy hospital ship that travels to Central and South America giving free services to the local people. 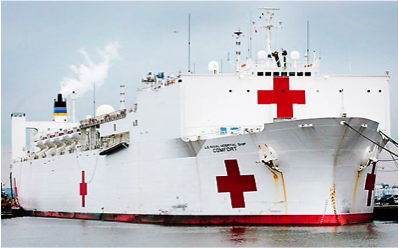 The main activities I helped with were surgeries onboard the USNS Comfort; medical clinics with general practitioners, pediatricians, optometrists, and dentists; and education. Education topics included neonatal resuscitation, public health, water purification, amongst other health issues. One of my most rewarding experiences was shared by LDS Charities: “In Colombia, Lenberg helped 12-year-old David with massive burns on his hands, face, arms, legs, and back; he also had a massive infection on one hand and contractures (shortenings of muscle, tendon or scar tissue that cause deformity) in his fingers on the other hand. Lenberg said she tried “so, so, so hard” to get the boy in for surgery the next day, but was unable to do so because the surgical area was overbooked. To Lenberg’s surprise, David was the first patient admitted the next morning for surgery. What an amazing and rewarding experience this was for me! One of the other most prominent charities to provide volunteer nurses on the USNS Comfort was Project Hope. Project Hope provides many opportunities to educate those less fortunate in foreign countries; the next trips are scheduled for Haiti, the Dominican Republic, India, and more. Another organization called Operation Smile is one of my favorite charities! They provide free surgeries for children in need of cleft palate or cleft lip repairs. Their mission trips are less than a month in length; they travel internationally to countries including China, Morocco, and Russia. If you want to help with disaster relief in the United States, the American Red Cross is a good option for you. Other local opportunities can be found if you look search around your community. Talk with your public health department or local nursing homes. If looking for volunteer opportunities lasting for longer amounts of time, the US Peace Corps provides “life defining experience in more than 60 countries.” These assignments last for approximately two years. Nurses volunteer in a variety of ways, but most missions revolve around educating and empowering people in poor communities. The Peace Corps Response is another alternative for nurses who cannot volunteer for quite as long. These assignments are approximately 3-12 months and are for nurses who have 10 or more years experience. There are so many neat opportunities for medical professionals! These experiences will not only help you to grow individually, but it will help your resume to grow as well. If you are feeling stuck in your nursing situation whether it be as a new graduate RN or as a charge nurse of the same unit you’ve been at for a while, then try volunteering for a change of pace! Nurses change the world one person at a time! Courtney, RN from www.fromnewtoicu.com, guest posts to talk about her struggle getting her first nursing job and how she overcame it – she volunteered! Now, she works in the medical ICU. I personally thought that this was a great idea and wanted more people to know about it. Her website is great too — its goal is to make finding nursing school information as easy as possible. This will make it faster for both high school students and high school counselors looking for nursing school requirements, such as the GPA requirements, tuition information, prerequisite classes and more. Go check it out! Posted in Nursing and tagged new grad, new grad job, New nurse, nurses, volunteer. ← Get a Costco Membership at a discount!